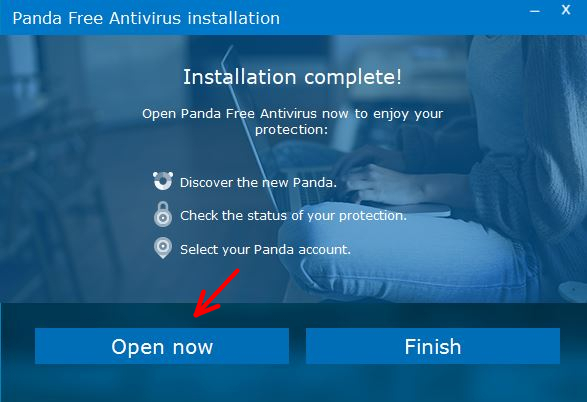 This short manual guide for Panda Free Antivirus will help you install the software on Windows 10 operating system. The step-by-step guidelines will make the installation process easy and convenient. Firstly, you should download the application from our page. 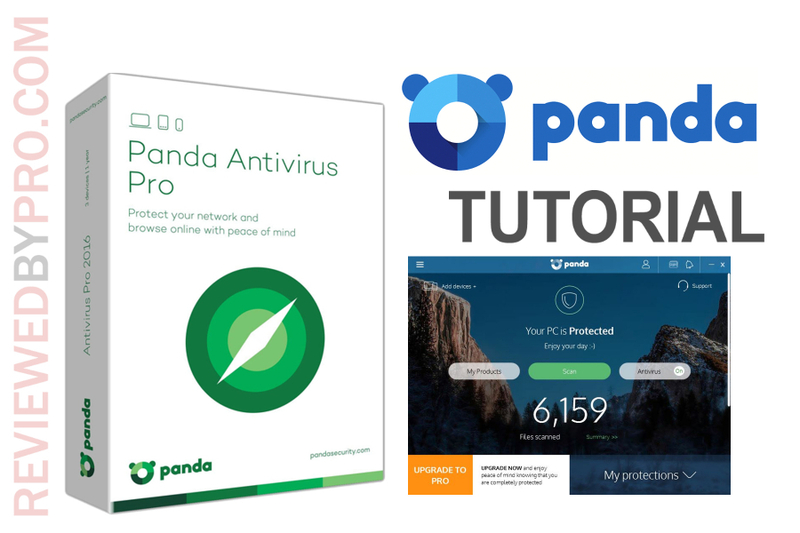 In this manual, we will show you how to install the basic version of the program – Panda Free Antivirus 2017. As you can see, the installation file is really lightweight – it’s only 1.89 megabytes. That’s why it doesn’t take up much time for the installation file to download. 1. Now, since you have it on your hard drive, you should locate the file and press on it. Open the installer package by double-clicking the file. 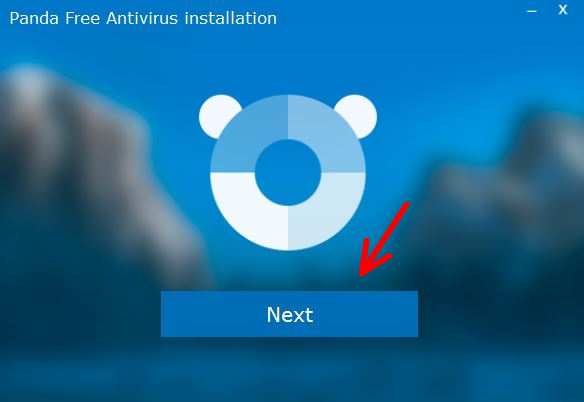 After a few seconds, you will get a message box on your screen that will ask you to confirm the installation of the program. Just press ‘yes’ and the Installation Wizard will do its job. 3. Once the Installation Wizard is open, click on “Accept and Install”. 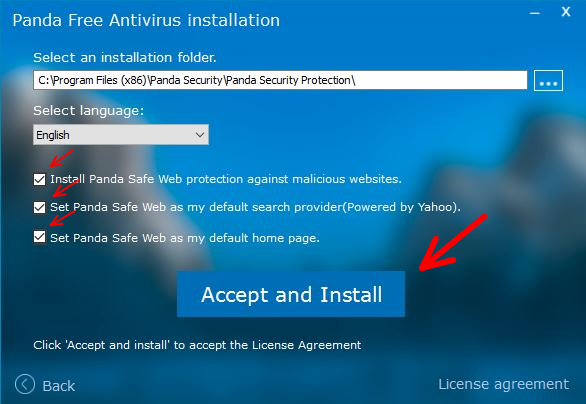 Don't forget to take a look at the checkboxes – if you don't uncheck them, the Wizard will install Panda Safe Web protection, set Panda Safe Web as your default search provider, and set Panda Safe Web as your default home page. If you don't want any or some of these features, unmark the boxes. 4. Now you will see a bar that shows the installation process. The installation of Panda Free Antivirus doesn’t take long since the program is pretty lightweight. Once the process is done, you will get a notification saying ‘Installation Complete!’. After you get this message, press ‘Open now’ and Panda Free Antivirus 2017 software will be opened. You should see a newly created icon on your desktop and it should also appear on your Windows Start program list. Now you have it fully installed and you can use your newly-downloaded antivirus software for free. 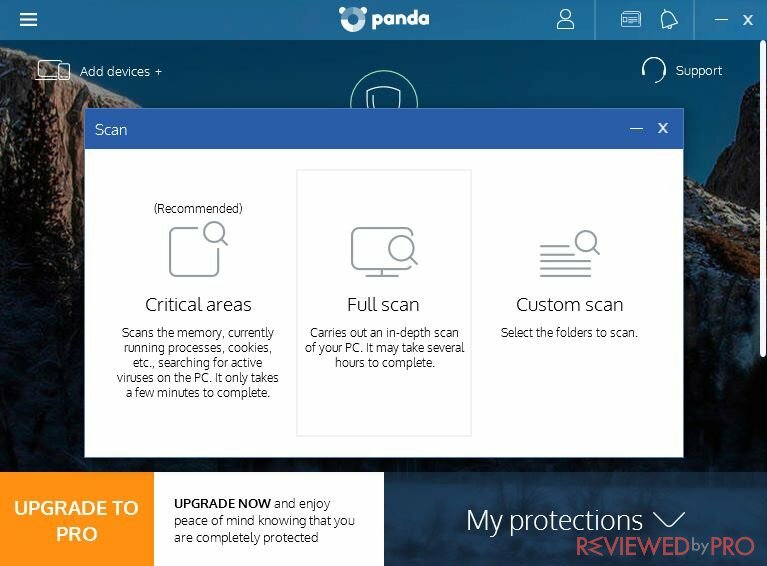 Scan – the Panda scanner will help you get rid of viruses and malware from your computer. This function has a ‘full scan’ and a ‘quick scan’ (a scan of critical areas). A full scan might take up to five hours, but it will scan your computer thoroughly. The quick scan should be performed every day when you start your PC. There is also a custom scan where you can choose the parts of your system to scan. Online tech support – here you can click if you need any help. There are self-help articles, as well as an email for tech support. Settings – it will be a lot more convenient to operate the program if you choose your own preferences and set the notifications in the way that they wouldn’t be bothering you. Be sure to check this feature before scanning your computer. You can also disable your protection for some time or add exceptions to it. You will also be able to see the logs from previous scans. Help – you will be redirected to a page with all the necessary information about Panda. Security news – here you will get many interesting articles about malware, cyber-attacks, and similar things. Share ideas and solutions – here you will be redirected to the forum website of the application. About Panda protection – information about the newest version of Panda Anti-malware. 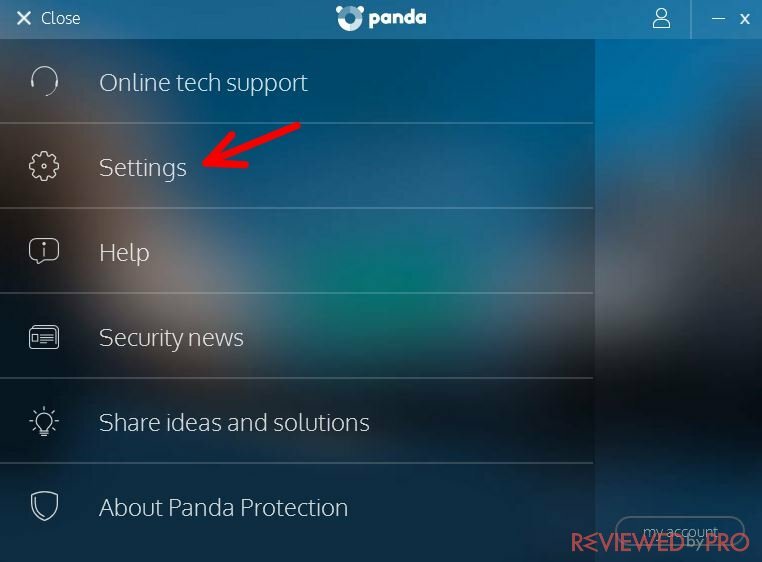 Panda Security has a few different products that might be suitable for you, so before pressing the ‘download’ button, you can overview these different products and think which would be the most suitable for your PC. The ‘advanced protection’ level of this antivirus app has a few more features that might be of help. One of the most interesting additional features is file sharing and downloading without any viruses. It might be true that most people infect their PCs by using dangerous websites to download files, which are not scanned before downloading. When you have Panda Free Antivirus with the ‘advanced level’ protection, you do not have to worry about that, as the files are scanned and cleaned before downloading, so there is no way your device will get infected. There’s also a ‘premium protection’ level, which is the most expensive – the price currently stands at $48.99 a year. 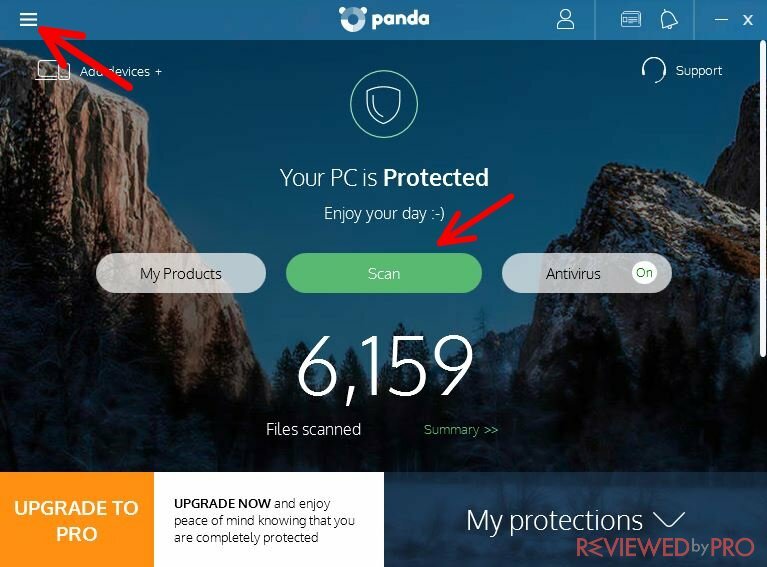 The ‘premium protection’ level gives you all the benefits mentioned above and something more – it can make your PC go faster, as this version of the Panda Antivirus 2017 program has an optimization tool that will let you get rid of the unwanted running apps in your system and also clean the junk. This optimization tool is a great thing for people with slower and older PCs – it can make a huge difference if the program is run at least twice a month to clear the junk from your device and also keep the registry clear. In addition to that, you will also be able to pay online and shop in e-shops without having to worry about stolen credit card credentials and even identity theft. Another notable feature is children protection. The premium level has a powerful tool that can block any website that would be dangerous for a person that’s under 18. Having this in mind, the ‘premium protection’ level really offers you a full kit of powerful tools to stay safe, so it is the most valuable choice.